The Oak Lincoln 3-Light Glazed door is is the perfect partner to the solid Oak Lincoln for rooms where extra light is required. This glazed internal door has accentuated vertical lines, which give it a traditional feel. 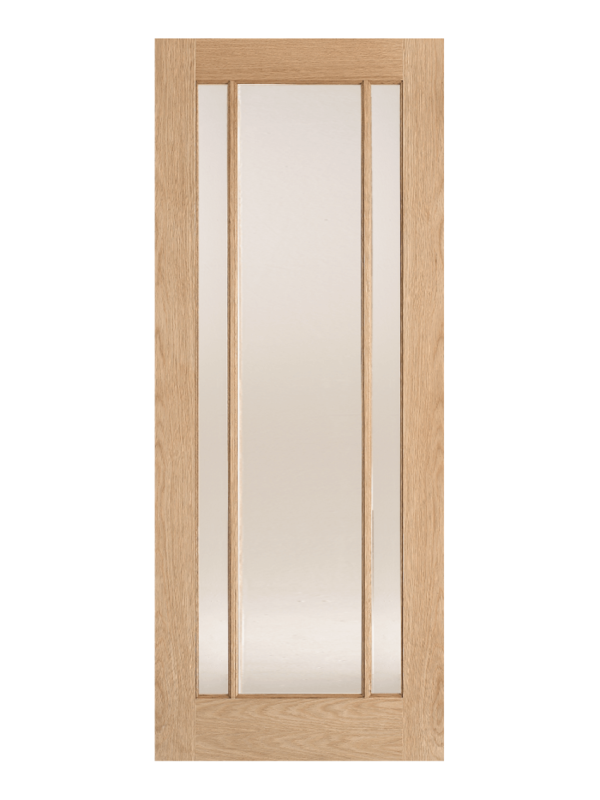 This internal solid door is suitable for all areas of the home including dining room, living room, study etc. except areas where privacy is needed. The Oak Lincoln has three, full length, recessed, clear glazed panels separated by raised beading down either side. An Un-finished, manufactured door featuring 10mm solid oak lippings over a solid core. Un-finished it is ready for your own choice of varnish or other treatment. . It comes with a manufacturer’s 10-year warranty. Adjustments can be made on all sides up to the depth of the lipping to make it a perfect fit for new and existing door frames. Hinges and door handles are not included. We always recommend a minimum of three hinges per door.